The last few house renderings on the home page have been so dismal that I finally gave up on photorealism and just did something neutral. The good news is that it includes the piers — you'll just have to imagine trees, terrain, stairs, etc. Read more about Yet another inept rendering! I did a new rendering, this time with a photo background. It shows the slope of the terrain and the zany pier foundation. It does not show any stairs leading to the main entrance. And, by golly, why should it? Who needs 'em! 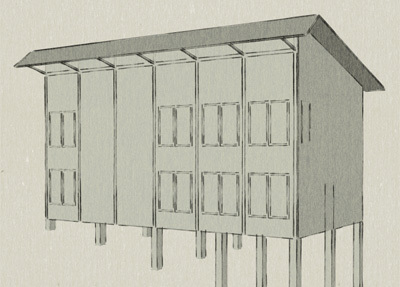 ETA: When describing this rendering on Twitter I said, "It looks like Vietcong HQ, only with fewer thermal bridges." After much waffling, Ted and I decided to bite the bullet and go for Passivhaus certification. More on this soon, but in the meantime we're busily weighing envelope upgrades in search of the best (read: cheapest) path to 4.75 kBTU/(f2year). I am superstitious and have no immediate plans to change the website name. The web address, of course, will not change. I am now grateful that I was unable to get http://www.almostpassive.com, which is boldly carrying out its mission to tell visitors "All You Need To Earn Almost Passive Income Online! " In other news I made a new house rendering, but don't get too attached because I'm likely to change it again in a few days. The new rendering places the solar panels on the top awning, which will be almost entirely unshaded and can fit 4.76 kW of DC goodness. The colors, which are currently quite ugly. We may also change the ratio of cedar shingle and reverse board and batten siding. 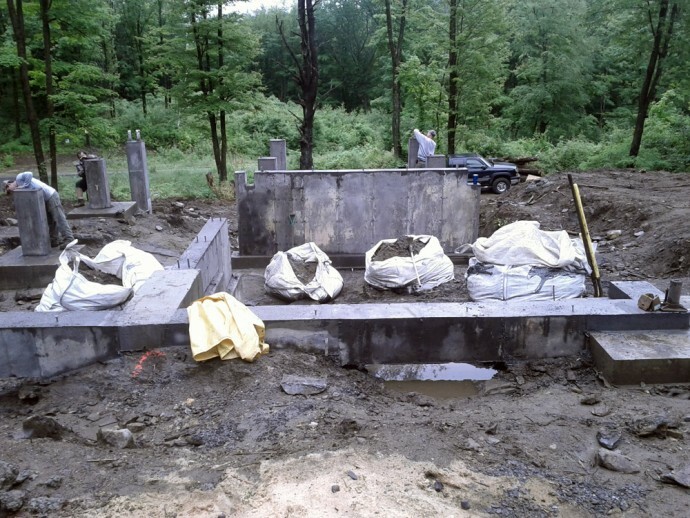 The terrain and foundation, since our building site is a wooded rocky hillside and not an eerie CAD plain. Awnings will appear over the lower windows, though they might be removable in some way to allow full winter heat gains. 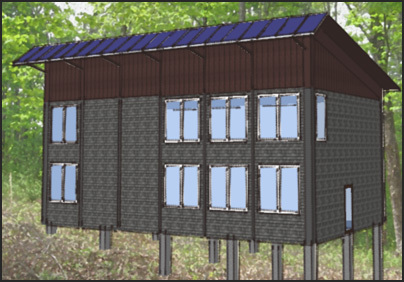 A solar collector for hot water might appear in the gap between the two groups of windows, assuming we can afford it. Several months ago our energy guru Marc wrote on his blog about the payback on energy-efficient construction. He said that whenever he gives a workshop, someone invariably "stands up and makes an impassioned speech about how all this is well and good but what's the payback?" [My] second response is to poll the building and design professionals assembled to see how many in the past year or two had a (residential) project in which they installed a 10 kW automatic generator, or they did a kitchen that cost over $100,000. Usually most of the hands in the room slowly go up. How rigorous was the payback analysis on each of those purchases? My observation is that people spend money on what makes them feel good, and [...] what makes me feels good [...] is seeing my ecological footprint shrink. Why does that expenditure draw so much more scrutiny than the money spent on the magazine kitchen or the BMW? Exactly — I couldn't have said it better myself (which is why I quoted him directly). Ted and I admit that this house is going to be extravagantly energy-efficient, but we're deliberately building this way because it's more important to us than a gleaming high-end kitchen, walk-in closets, or the kind of grandiose master bathroom my sister Debby calls a "shrine to hygiene." Not that there's anything wrong with those features; I'm not criticizing people who choose those features over energy-efficiency. Hey, some of my best friends have oversized jacuzzi tubs! But I've noticed that after they move in, and particularly after the first cold winter or hot summer, they suddenly wish they'd paid more attention to insulation or the glazing direction. Frankly, after the first few months in our house I'll probably wish I'd made the bedrooms bigger or left more room in the budget for fancy cabinets or counters, but hopefully I can console myself by watching the electric meter run backwards or by listening to the gentle whirr of our high-efficiency heat recovery ventilator. As for the financial aspect of "payback," the only way this house will earn back its cost is if energy prices continue to rise. But frankly, I hope we never get payback on this house. I'd much rather they discover a cheap and clean form of fuel that makes Ted's and my energy hacks look about as useful as a 1950's backyard bomb shelter. I will be sad indeed if things become so dire that only a house like ours will be liveable. So we're not building with payback in mind. We're just trying to be the change we want to see in the world, blah blah blah, and hopefully not get too deep into debt as we do it. On a related note, I'm now soliciting ads on this blog. I don't have any high expectations, but I figure there's no reason not to try, particularly since I'm already a web designer and can tart the site up for free. I promise this won't turn into some hideous affiliate marketing site that's been rendered unreadable by too many ads and useless pop-ups. 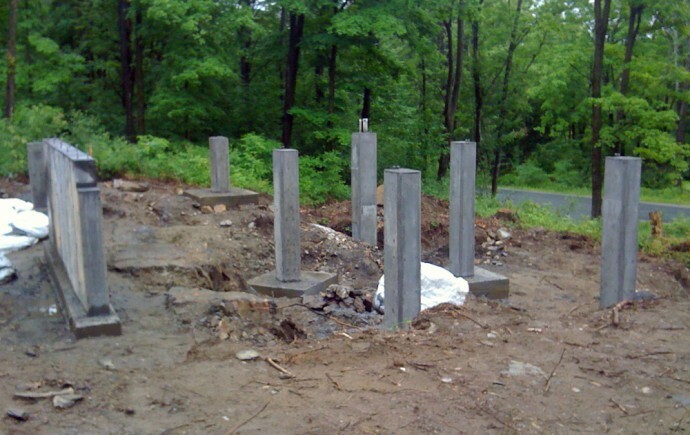 It is with great pleasure that I unveil our newly-poured piers. Foundation, I dub thee Nerdhenge. Since the piers will be extremely visible, we paid extra to add some pigment to the concrete mix. The color was called "Onyx," a name apparently chosen by someone who either never saw (A) the actual product or (B) onyx. But we're satisfied — it has an attractive bluish cast compared to unadorned concrete, and it will hopefully give our house a certain klassy je ne sais quoi. The photo above shows the lower three rows of piers, and the photo below shows the view from the top. This picture shows the grade beam, which Ted can explain in a geekier post. Read more about At what price passiv? Things are going swimmingly. They poured the piers yesterday, and the dismal unending rain means that the concrete will probably cure to maximum strength. We've also hammered out all sorts of details with Eli, Marc, and Ben, and a lot of problems and challenges seem to be melting away. I figured out a more attractive and efficient way to add solar electric and hot water (new drawings forthcoming), and everything is looking great. The problem? 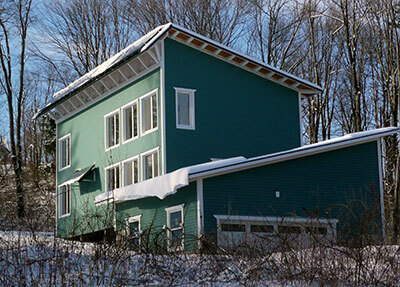 Our many envelope tweaks and revisions have brought us tantalizingly close to Passivhaus performance levels. This is bad simply because we now have to decide whether to bite the bullet and pay the extra $3,000 (or more) to make it happen. The return on investment will be lousy. The difference in utility costs between the house we're building and a certified Passivhaus will probably be less than $40/year. We've already ordered Passivhaus-certified windows and are seriously considering paying extra for a Passivhaus-certified HRV because of its many good features. And of course we've minimized thermal bridging in the envelope and are wrapping the house in heaps and heaps of dense-pack cellulose, plus a 4" exoskeleton of polyisocyanurate. But we haven't paid the $1,500 (give or take) to have Marc model the house in PHPP, the über-spreadsheet that analyzes every detail of a house's energy performance. And you can't have a certified Passivhaus without running it through PHPP. Of course, PHPP is only the first step. Odds are that we'll fall a little shy of the Passivhaus performance requirements, so our next move will be to add more insulation somewhere or tighten up the envelope a bit better. And that will cost more money than it will ever save us. So why bother? I don't think I'm attached to having a certified Passivhaus. As you can see from the name of the website, I'm quite satisfied with our not-quite-passiv status. Also, I seriously doubt it will make a difference on resale whether the house is certified or not, since it's going to be a freaky-efficient house either way. But there's a symbolic value to getting certified. 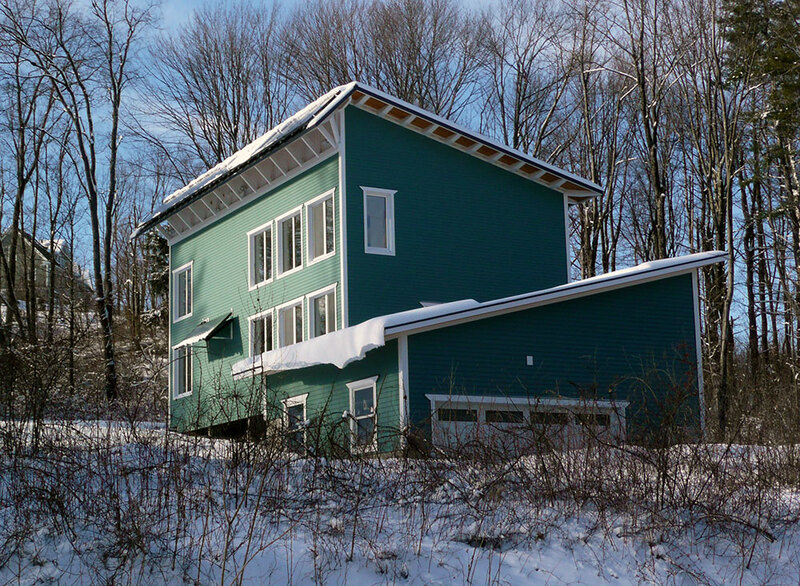 Only a handful of certified Passive Houses have been built in the United States, which means it's still an inspiring new concept. One of our major goals in building an energy-efficient house is to inspire other builders and homeowners, and having the Passivhaus label and certificate will help get the word out. Several people working on the house, both directly and peripherally, have told me how exciting it is to work on such an efficient design. They really like seeing someone do it right and not cut corners on energy performance. We're trying to practice "trickle-down green building," meaning that the way we're building this house will hopefully catch on and eventually become the new normal, at least to some degree. 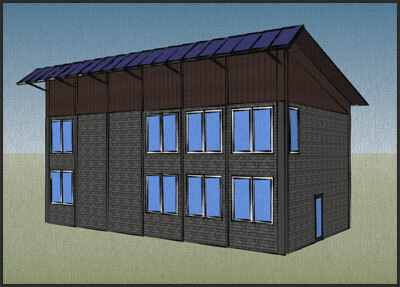 Building an actual Passive House rather than an Almost Passive House might further this goal. Does that count, or should we just return to the ROI and call it a day? I should add that building an affordable house is another one of our goals, because it's not very inspiring if only people with endlessly deep pockets can build this way.